The Musca is one of the most sold remote controls of Tyro. 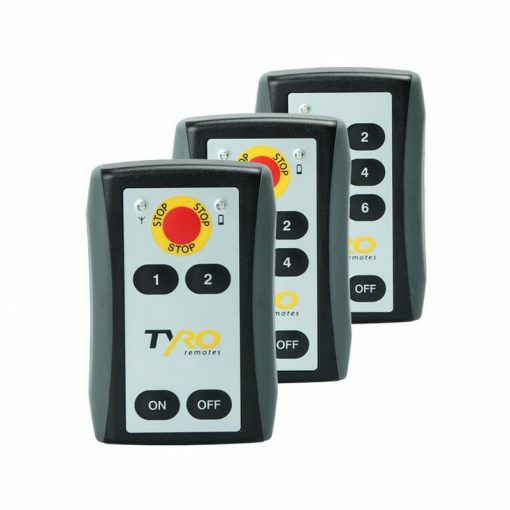 The hand held transmitters comes in compact format- and price wise the most favorable remote controls out of our assortment. The Musca is a more comprehensive variant of the Lyra, our remote control with 2 channels. 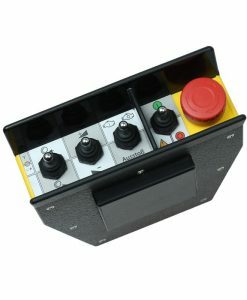 However, you can choose the Musca with a 4 or 6 channel control. 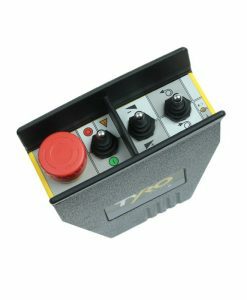 The transmitters with 2 or 4 channels are also provided with a stop button. 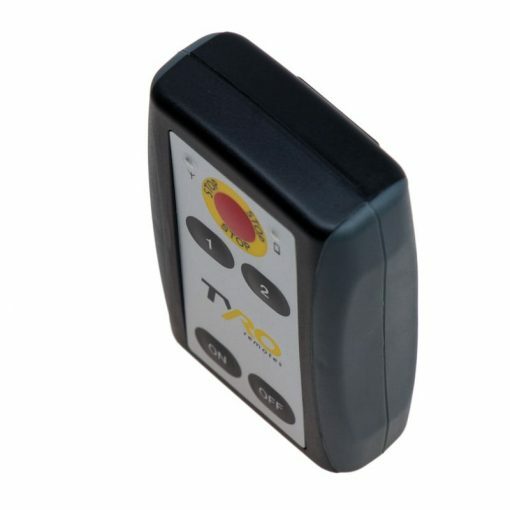 Besides the compact format, the Musca remote control fits well in your hand. 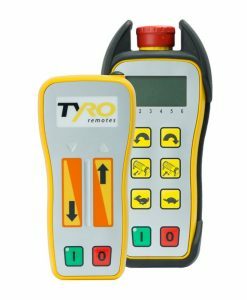 The transmitter can easily fit in your pocket or you can make use of the handy belt clip. 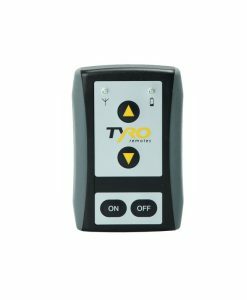 The remote control is designed for intensive use, also under exceptional circumstances. 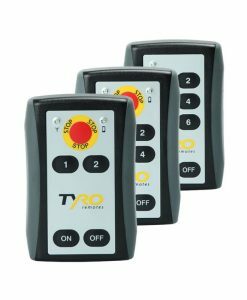 The moisture- and dirt-resistant remote control is equipped with a high-quality industrial keyboard that is easy to clean. The Musca can be applied in the most diverse industries. 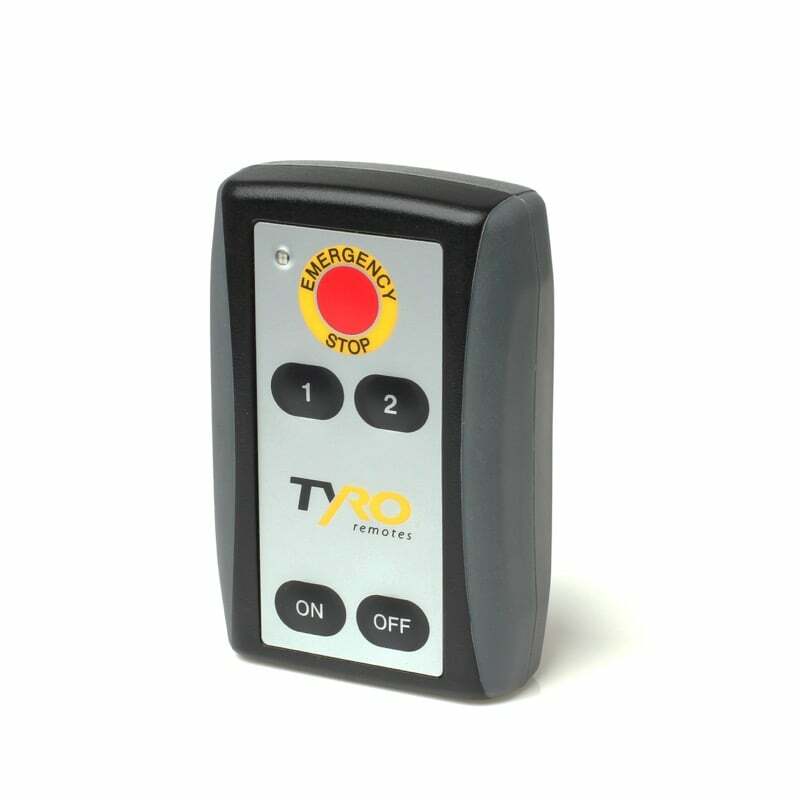 It is an ideal remote control for vehicle applications (e.g. winches), but is also used for maritime and agricultural applications. For example, we transformed the Musca into an OEM product for a client’s AEROdisc. The Musca is provided with a 9 Volt battery that can be used for at least 2 years in normal conditions; the radio remote control has an extremely low power consumption. 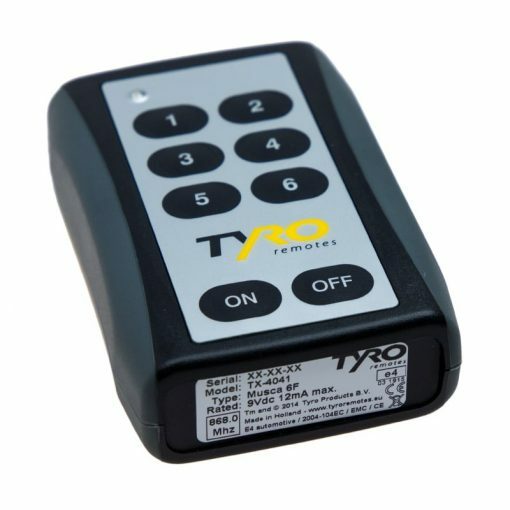 As a standard feature the Musca hand held transmitter is provided with the 868 MHz broadband frequency, it is also possible to deliver this in a 915 MHz broadband frequency. 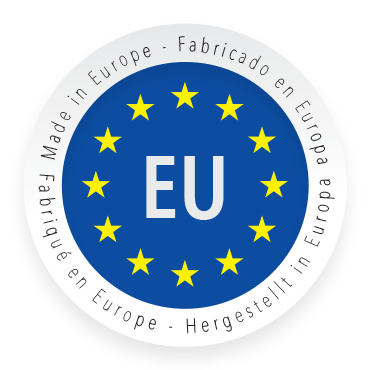 The Musca has EMC / E11 certification which means that it can be used on public roads in more than 25 countries. 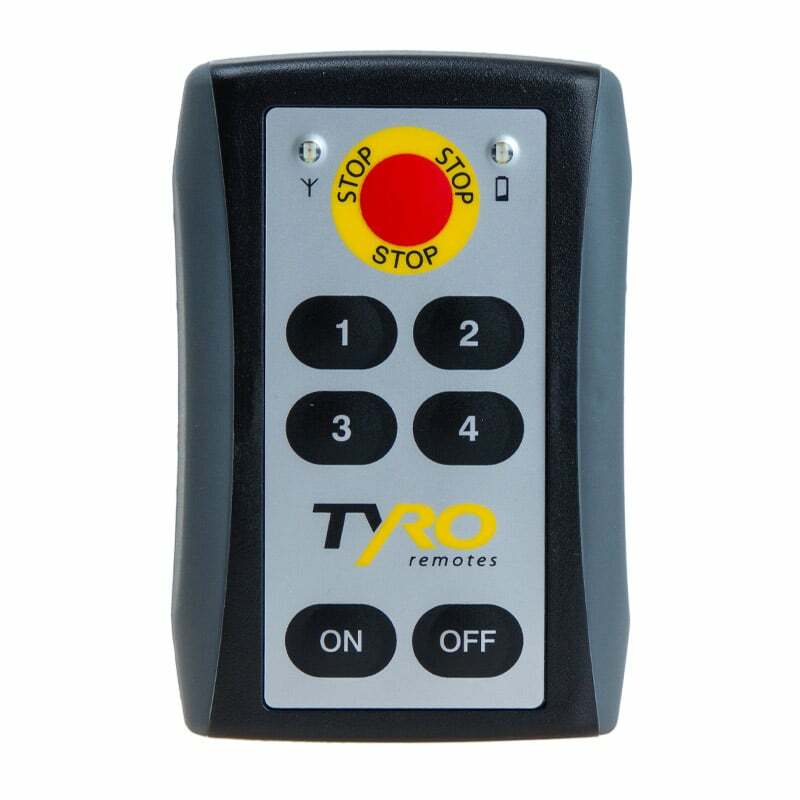 Each remote control and receiver has its own unique 24 bit code so that the receiver only ‘listens’ to its own specific remote control. The Musca remote works whether you opt for the 2, 4 or 6 channels; along with the radio receiver “Aquarius”. 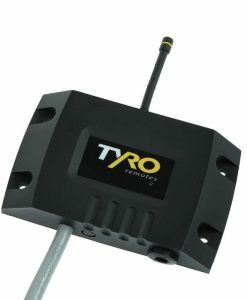 This receiver is 100% waterproof (IP68) and has 6 ports. The Aquarius is available with a flex or BNC antenna.